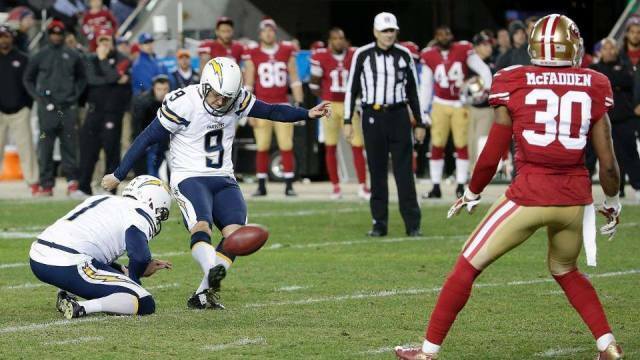 San Diego Chargers kicker Nick Novak kicking the game-winning 40-yard field goal in overtime. Courtesy of San Diego Chargers Facebook. The San Diego Chargers erased a 21-point first half deficit to beat the San Francisco 49ers 38-35 in overtime Saturday night at Levis Stadium in Santa Clara. Quarterback Philip Rivers delivered one of the grittiest performances of his career, and amassed 356 yards and four touchdowns, three of which came in the second half, even though it has been reported by ESPN that Rivers may be dealing with a bulging disk in his back. It wasn’t all peachy, though, for the veteran quarterback. Rivers’ two interceptions—one of which that went for a touchdown—in the first half helped contribute to a big hole the Chargers dug themselves. The run defense was the other leading factor that helped the 49ers jump out to a 28-7 lead at halftime;San Francisco ended the night with 355 yards on the ground compared to 98 for the Chargers. However, things started to click for the Bolts in the second half. Rivers finally got the offense together a little less than six minutes left in the third quarter, and found long-time tight end Antonio Gates for a one-yard score. On the very next possession the Chargers got a gift when defensive end Corey Liuget recovered a fumble in the end-zone for a touchdown on a fumble that was forced by defensive ends Dwight Freeney and Ricardo Mathews. The Chargers defense shored up holding the 49ers to one touchdown in the second half, and helped set-up an 11-yard touchdown to wide receiver Malcolm Floyd to tie the game at 35, with just 29 seconds left in the game. San Francisco got the ball first in overtime, but safety Eric Weddle forced a fumble on its second play, and it was recovered by Chargers defensive lineman Sean Lissemore. 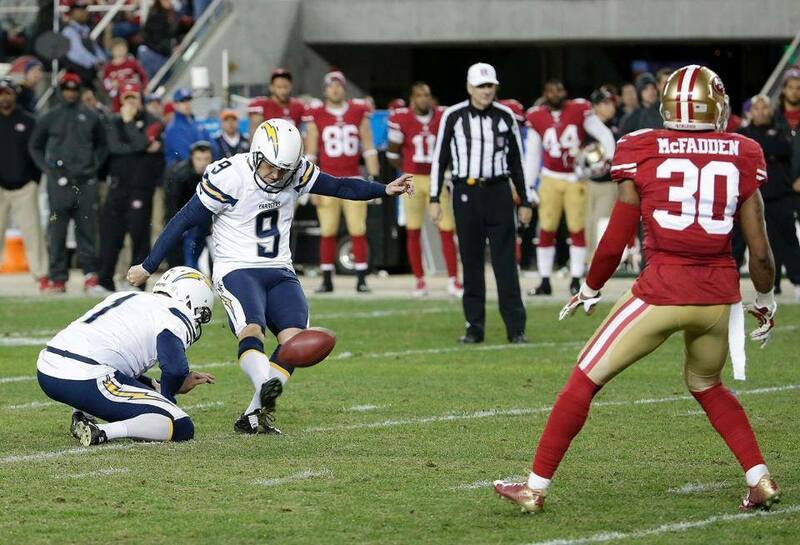 Rivers and running back Ronnie Brown then got kicker Nick Novak in range for a game-winning 40-yard field goal. Even though it was no secret that Rivers was not at full health he was able to mount a legendary comeback for Chargers history, and garnered much respect from some of his teammates. The Chargers are very much alive in the playoff hunt with the win, and depending on what certain team’s do on Sunday they may have a chance to control their own destiny in the final game of the season against the Kansas City Chiefs next Sunday.